No pumpkin spice or pumpkin flavors until it’s chilly enough to need a sweater and a scarf. No black friday shopping nonsense, Thanksgiving stress should be used for planning an epic meal, not buying a discounted vacuum. No Christmas decorations, music, movies, or anything peppermint until December. These small steps have always kept me focused on the holiday at hand, and made me grateful for the present. 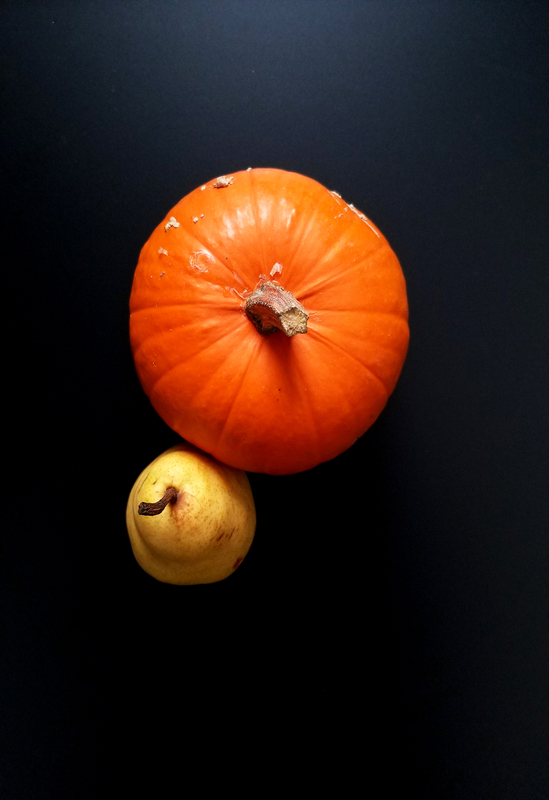 Pumpkins are a unique phenomenon in the food world. You can ask just about anyone how they feel about pumpkin things and they will shout to the rooftops about their love for the squash, but give them a spoonful of pureed pumpkin and you will get a different story. People like the flavors that accompany pumpkin, not the pumpkin itself. Although it’s beautiful it can be a little basic, starchy and earthy. But with incredible nutritional qualities including a wide variety of trace minerals and antioxidants, making pumpkin as flavorful as possible should be our number one goal. Tried and true flavors that have always elevated pumpkin include warming spices (cinnamon, nutmeg, ginger, allspice, cloves), apples, chocolate, sage, and toasted nuts. I wanted to use another fall sweetheart to make a match made in Autumnal heaven. 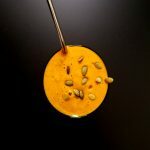 Juicy, tender, sweet, succulent, and just slightly acidic make a perfect match for the creamy earthiness of pumpkin. With a few other flavors of the season including warming spices, and maple I created two different kinds of breakfasts. Whether you are enjoying a chilly October in the Pacific Northwest or a hotter than average California Fall you can take advantage of these delicious pumpkin-pear breakfasts. 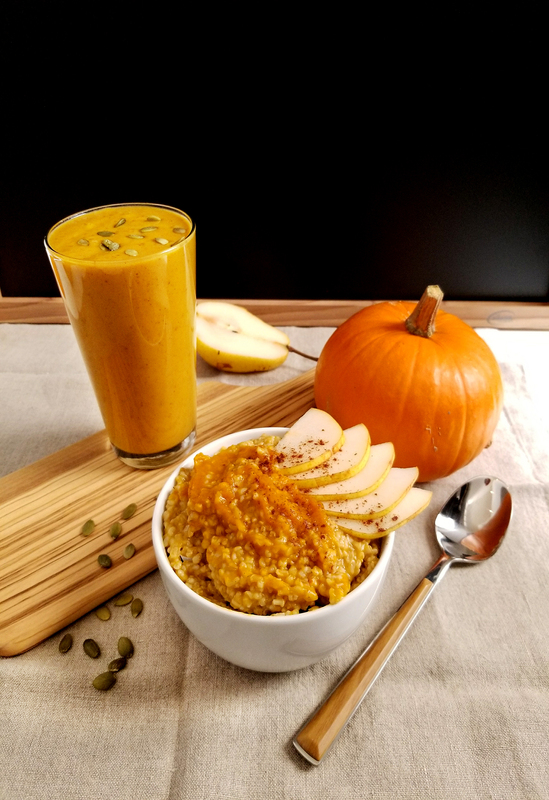 Oats are a staple in my house and this combo of pumpkin, pears, apple cider, pumpkin spice and a touch of maple will fill you with the warmth and energy you need to sustain your day. 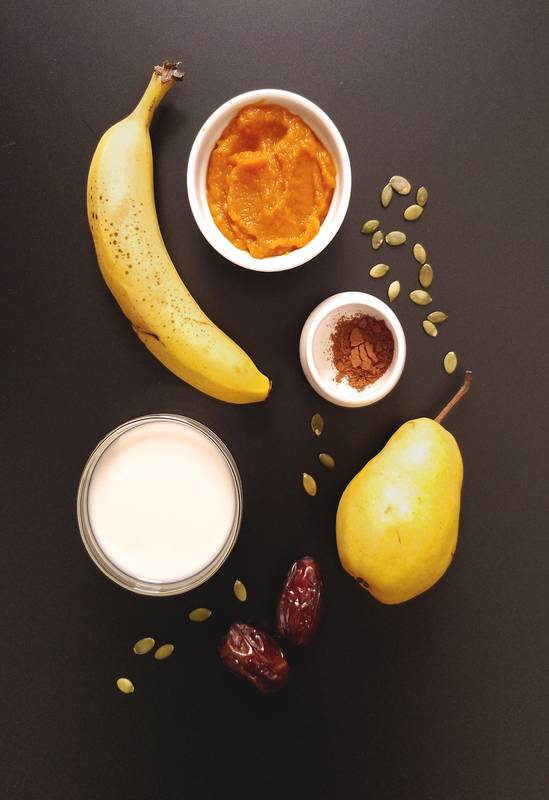 If smoothies are your thing, get ready for the healthiest pumpkin pie you’ve ever tasted. With whole medjool dates, bananas, and tumeric, your cells will be begging for more! Both of these recipes utilize canned pumpkin, which is a great staple pantry item this time of year. If you have leftover pumpkin puree, just place it in an ice cube tray and freeze it, then keep for another smoothie later in the week! I hope these recipes will sustain your leaf crunching days of plaid parties and pumpkin patches! 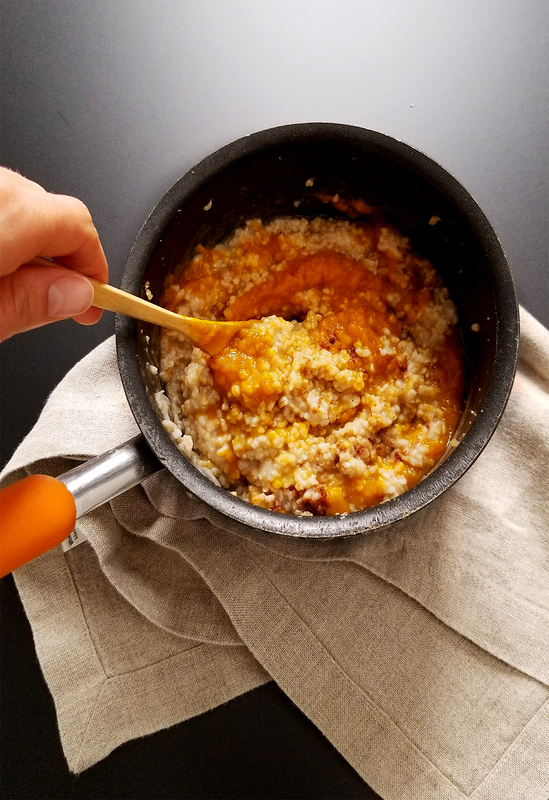 This lightly spiced sweet and savory oatmeal will fill you up with all the wonderful flavors of fall! In a small sauce-pot bring the water and apple cider to a boil, add the oats and cover. 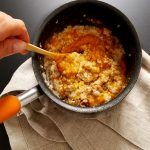 Reduce to a low heat and let simmer for 10-15 minutes, until the oats are tender. 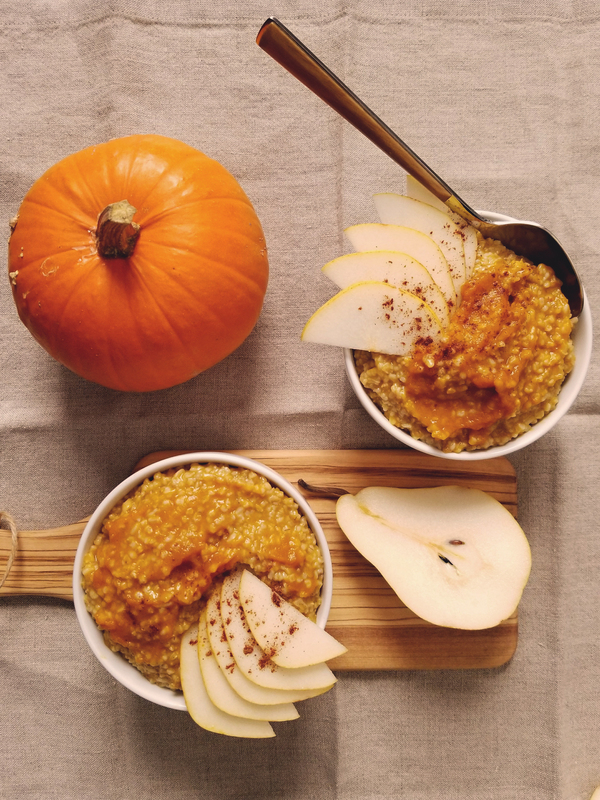 When oats are cooked, stir in the pumpkin, maple syrup, and spices. Chop or slice the pears and serve on top of the oats, finish with more pumpkin spice if desired. A delicious way to gather fall in your glass. 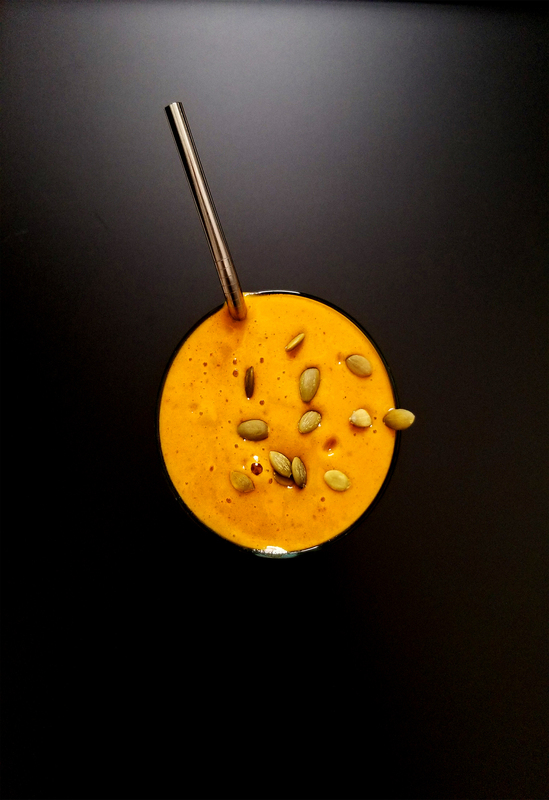 With an extra punch of antioxidants from the ground turmeric, this smoothie is a great start to your day. Place all of the ingredients in a blender, and blend until smooth. *Too add even more fiber to the oats or the smoothie try adding a tablespoon of some ground flaxseeds!